UPDATE: Mystery is now complete, feel free to download each of the files (Fabric Requirements and 5 Clues). Fabric Requirements: Click here to download the file. We would love to see your fabrics! Share a photo, bring them by the store! Need help picking fabrics, send us a message! Clue 1: Click here to download the file. Are You Ready? Let's see your clue 1 pieces, share a photo on the Aunt Judy's Attic Facebook Page or send us a photo. We would love to see your photos! Clue 2: Click here to download the file. How exciting! Don't forget to share your Clue 2 pieces, post a photo on the Aunt Judy's Attic Facebook page or send us a photo. Seeing your photos is eye candy for us! Clue 3: Click here to download the file. Yay! We are at the midway point! We would love to see your photos! Feel free to share them on the Aunt Judy's Attic Facebook page. Clue 4: Click here to download the file. Woohoo! We do not have any more HST to make! Lets see some Block 1 Pictures!! Please share your photos on Aunt Judy's Attic Facebook page. Clue 5 & Reveal: Click here to download the file. At last! 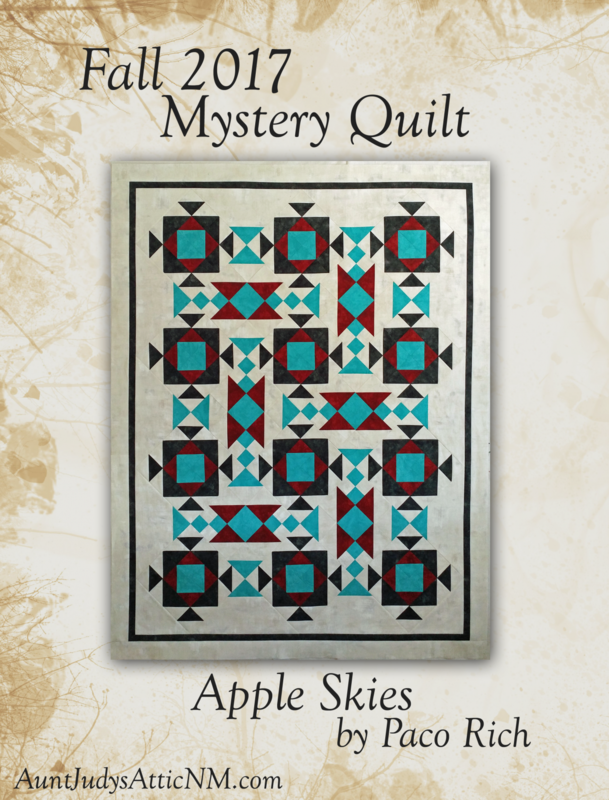 The final clue and the quilt top reveal!!! Caution: You will see the final quilt layout! We would love to see your quilt tops. Please share your photos on Aunt Judy's Attic Facebook page. 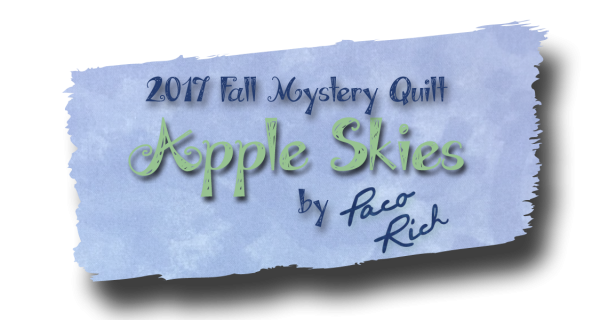 This Apple Skies Mystery Quilt has been so much fun to host. I hope all of you enjoyed making the quilt just as much as I had hosting it. I hope to see you back here at Aunt Judy's Attic for other fun projects!